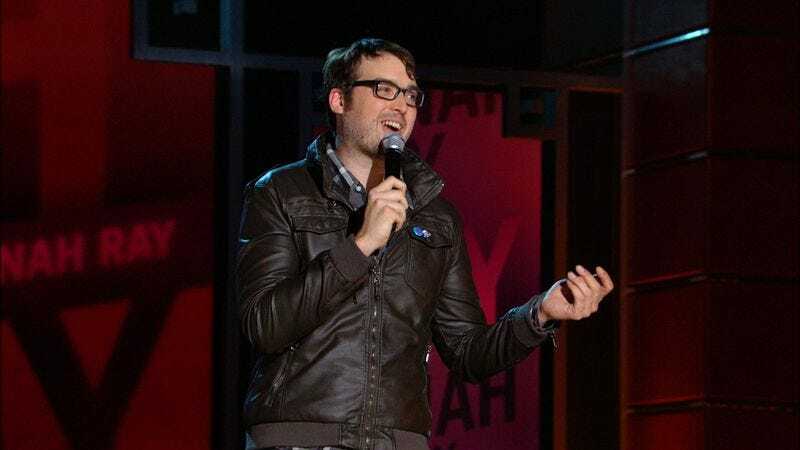 Those familiar with Jonah Ray, the tall comedian from the Nerdist podcast and The Meltdown Show, are probably aware that he’s into music. (Look at the guy, for crying out loud.) But now he’s putting his money where his music-loving podcasting mouth is with the launch of his own record label, Literally Figurative Records. The label is an imprint of A Special Thing Records, and will put out both comedy and music releases, including a series of 7-inches that are, in fact, both. According to a post on Ray’s Tumblr, The Mutual Appreciation Society series 7-inches will feature “a comic on one side and band they are friends with on the other,” including splits from Matt Mira and Jenny Owen Youngs, Wil Wheaton and Nerf Herder, Alex Hooper and Fartbarf, and Ray himself backed by Mikal Cronin. Other Literally Figurative releases will include a 7-inch from comedian Paige Weldon, Matt Dwyer’s debut LP, and the LP version of Nick Youssef’s debut, Stop Not Owning This.